I’ve been taking a lot of pictures at the Palmerah marketplace lately. I’ll be posting them gradually, and I figured I’d have some geeky fun first and draw a map to give you a sense of how the whole place is laid out. You can click on the map for a bigger version. 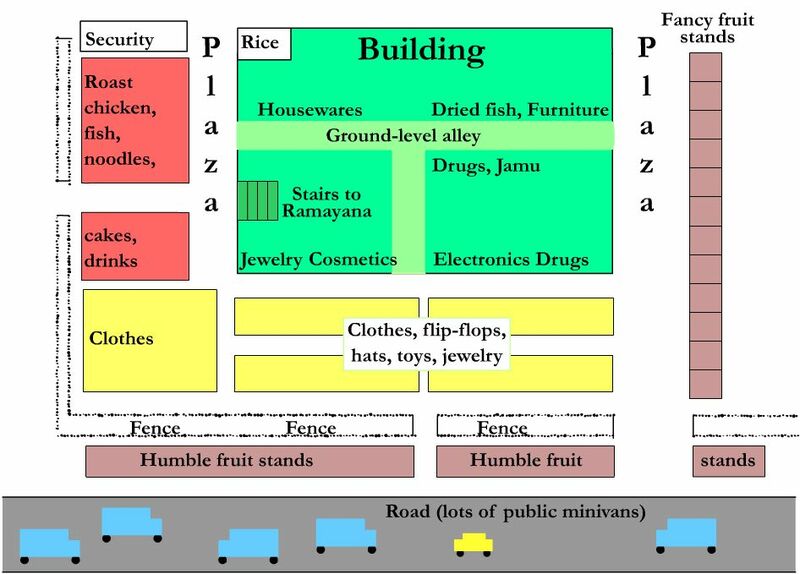 This seems to be a pretty typical Indonesian market design: a sort of hulking concrete building with a maze of little stores inside, and a plaza full of stalls outside. Inside the building are durable goods like housewares, jewelry and clothes. Produce stays outside. On the second floor of this particular market is a Ramayana department store, your one-stop source for blaring music, junk food and cheap t-shirts. Here’s the front, taken from where the red X is above. You can see some humble fruit stands in the far-right corner. And here’s a picture of the road, taken from the humble fruit stands. 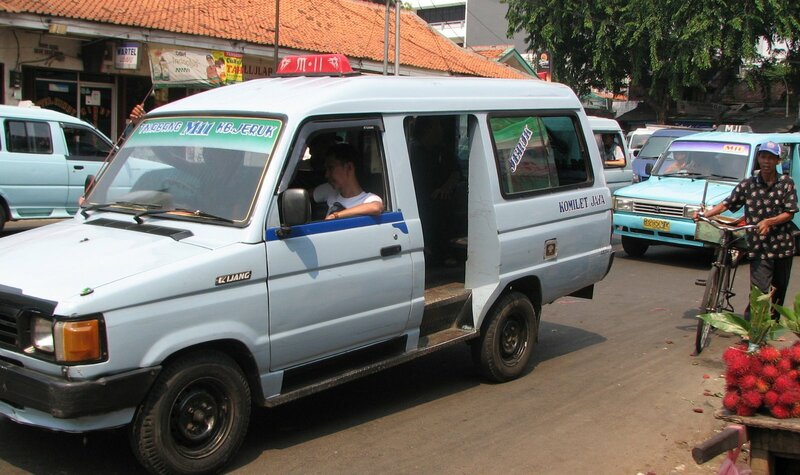 This road seriously has more public minivans (mikrolet) than any other place I know in Jakarta. Every minivan route for miles around must come through here. They always create a huge smoggy traffic jam. You can see some fuzzy red rambutans in the corner. More on those later. How do you manage to go around a pasar and taking pictures without people staring at you ? Not to mention that you are a ‘bule’ which I don’t remember seeing a lot of you guys in a pasar :), unless Jakarta is now such a hotspot of expatriates that you can see bules all over the city. Anyway, love your blog, oke banget lho. 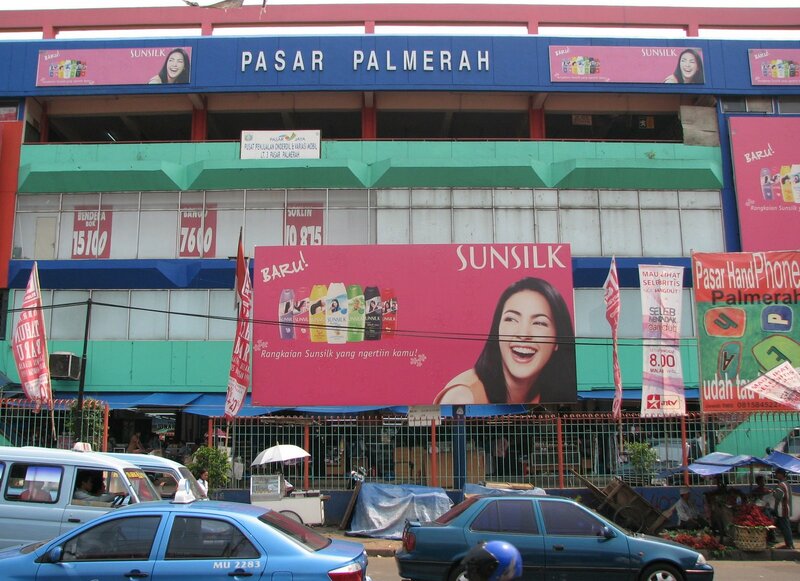 ahhh… pasar palmerah. used to drive by it everyday since i used to work around that area. thanks for the picture. Diny, you must be happy not to drive in that crazy traffic anymore …. You think you get stared at??? I used to work near that market, and during the day walking to the best Nasi Padang in town. Gah.. miss that place. Kopi Susu 2 Create a free website or blog at WordPress.com.